What to do with all that leftover turkey or ham after the holidays? And the cranberries! 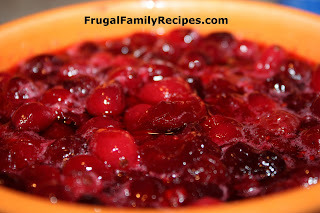 I love cranberry sauce and make it each year with fresh cranberries; for Thanksgiving and Christmas. I always try to buy extra packages during the holidays. They are nearly impossible to find at the grocery stores during the rest of the year, and, they make great ice packs for boo boos and injuries. The cranberry sauce I make is quite simple and delicious. Cranberries (rinsed and sorted), 1 c. water, 1 c. sugar, and a big pinch of (dried) orange peel. I also bought a can of cranberry sauce that was on sale, just as a back up in case I ran out. This year our family treated us with a delicious ham for Christmas. What a delightful surprise! The next day, my husband, Wayne, told me he had to drive to the grocery store. Knowing it wasn't time to make a trip to the store, I looked at him quite puzzled. Then he proudly proclaimed, "Biscuits!" I replied, "Biscuits? What for?!" "For the ham!," he replied. And off he went, to the store, for biscuits. When he returned home he prepared the biscuits and put them in the oven for our dinner. Then he warmed up a plate of leftover ham slices, in the iron skillet. Yum! When he was done, the whole family gathered in the kitchen to make their own ham sandwiches, with the biscuits. Before we all made it to the table with our yummy dinner, I remembered the extra can of cranberry sauce in the fridge. "I'm putting cranberry sauce on mine," I announced. "Anyone else want some?" "No," "No," "No," echoed through the kitchen. "Too bad, y'all are gonna miss out. It's going to be SO GOOD!" Have a holiday leftover recipe you'd like to share?